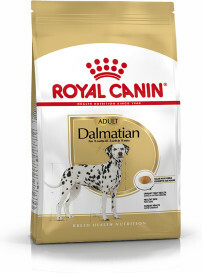 Dalmatian Puppy Royal Canin Dalmatian Puppy dry dog food, from 2 - 15 months old. Growth is an essential stage in your dog’s life: it is the time of big changes, discoveries and new encounters. During this key period, the puppy’s immune system develops gradually. 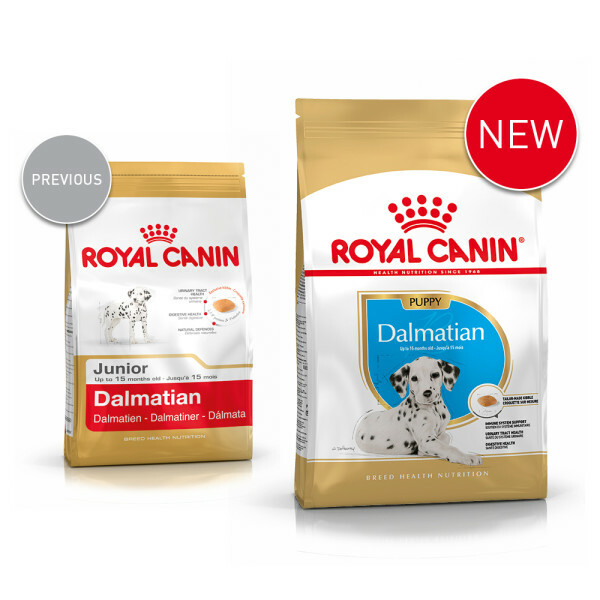 DALMATIAN PUPPY helps support your puppy’s natural defences thanks particularly to a patented* complex of antioxidants including vitamin E. *France, patent no EP1146870. 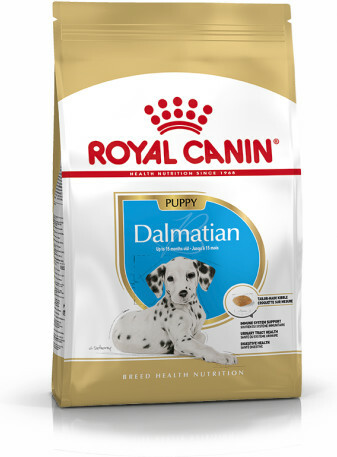 DALMATIAN PUPPY helps maintain a healthy urinary system thanks to adapted protein sources. Rice, dehydrated poultry protein, wheat flour, egg powder, maize flour, animal fats, vegetable protein isolate*, vegetable fibres, minerals, maize gluten, hydrolysed animal proteins, fish oil, fructo-oligo-saccharides (0.34%), soya oil, yeasts extracts (source of betaglucans), marigold extract (source of lutein), hydrolysed crustaceans (source of glucosamine), hydrolysed cartilage (source of chondroitin). *L.I.P. : protein selected for its very high digestibility. Crude ash: 7.5%. Crude fibre: 4%. Crude oil fats: 18%. Moisture: 0%. Protein: 25%. Vitamin A: 27500 IU, Vitamin D3: 700 IU, Vitamin E: 560 mg, E1 (Iron): 43 mg, E2 (Iodine): 3 mg, E4 (Copper): 6 mg, E5 (Manganese): 35 mg, E6 (Zinc): 139 mg, E8 (Selenium): 0.13 mg - Sensory additives: Yucca extract: 125 mg - Preservatives - Antioxidants.